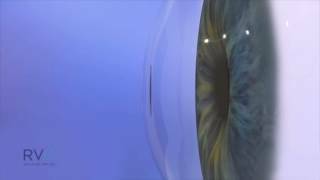 Be among the first in Houston to offer the Raindrop Near Vision Inlay solution to patients. Raindrop Near Vision Inlay offers a long term solution to the natural loss of near vision caused by aging. Raindrop inlays help reshape the front of the eye to improve near and intermediate vision quickly and simply, with results typically seen within one week. The inlay is placed just below the surface of the non-dominate eye during a simple ten-minute procedure. The result: a long term solution to presbyopia. Raindrop is a transparent, curved disc only the width of a pinhead that is inlayed within the cornea. Made of approximately 77% water and from material akin to a soft contact lens, it has similar properties and water content to the cornea. Imagine offering your patients a solution to the hassle of reading glasses. The Raindrop Near Vision Inlay procedure improves near and intermediate vision quickly and simply, with results typically seen within one week. If you are interested in freeing yourself from your reading glasses with a Raindrop® Near Vision Inlay, go the the link below and complete the qualification questionnaire, then schedule an appointment with Dr. Stewart to determine if you are a candidate for the procedure. Once it is determined that you are an eligible candidate, your eye doctor may implant a removable contact lens for five days to make sure your eyes will adapt as expected to the difference in vision. When you are ready to move forward, be sure to schedule the procedure on a date you can arrange for someone to drive you home following the surgery. You will be prescribed a steroid eye drop that you will need to begin applying two days before surgery. Age related near vision loss or presbyopia is the condition that leaves many of us reaching for reading glasses in our 40s and early 50s. Anybody who needs reading glasses for daily tasks such as using a mobile phone, reading a menu or fine print, or doing close-up work may be a candidate. Presbyopia, or age related loss of near vision, happens when your lens loses elasticity, making it difficult to change your focus to see objects up close. Everyone - yes, everyone - will eventually develop presbyopia. Most people who have had the Raindrop implanted see an improvement in their near vision within one week, and it continues to improve for several weeks. Patients need to use eye drops for several months for comfort and healing. The inlay is a tiny disc, about the size of a pinhead. It is comprised of approximately 80 percent water and is placed just beneath the surface of the eye. It works by gently changing the central curvature of the cornea, the clear front part of the eye. The procedure is complete in 10 minutes, usually. No, it is designed to be performed without LASIK. However, the procedure does require the use of an ophthalmic laser to create a LASIK-like flap just beneath the surface of the eye. One Raindrop Near Vision Inlay is placed in the cornea of the non-dominant eye. Both eyes work together to create one image. The near vision is improved in the Raindrop eye, while the distance is slightly affected. With both eyes working together, there is not a compromise for distance vision and patients still have a significant improvement in near vision. No. It is transparent, so no one will realize there is a Raindrop® in your eye. Very well. Since Raindrop is transparent, 99.7% of light passes through the inlay and reaches the back of the eye where the image is processed. Raindrop performs well in all lighting conditions. Yes, the Raindrop can be removed and, in most cases, patients will go back to the same vision they had before Raindrop. Be one of the first to offer your patients this revolutionary new solution. Dr. Colby Stewart has been selected by Revision Optics to begin using a new FDA approved device called the Raindrop Clear Inlay. This new technology offers a long-term, no-glasses solution for those suffering from presbyopia. The Raindrop Near Vision Inlay requires a simple laser procedure for a life-long benefit. To introduce the procedure to the Houston area, Dr. Stewart is offering an introductory rate of $1,500 for the first 10 candidates. The standard rate for the procedure is $3,800. The $1,500 includes testing, preoperative evaluation, the procedure, all associated fees, postoperative exams and drops. Call our Surgical Consultant, Yvette Gonzales at 713-558-8732 to schedule an evaluation for your patient with Dr. Stewart. During the free evaluation, Dr. Stewart will determine if your patient is a good candidate for Raindrop, explain the procedure, and schedule the surgery. Looking for information about Raindrop to share with your patients? Download the Raindrop Patient Education presentation.